Learn how to draw beer from bartenders of the Lokál Restaurant! We prepare courses for beer lovers. We can hold a birthday experience party for your friend as well as a teambuilding for your working team. The timetable of our School of Draught Beer also includes other new lessons. All of them are intended for interested applicants above the age of 18. The courses are held in both Czech and English in the Lokál U Bílé Kuželky Restaurant, Míšeňská 12, Prague 1. Get the tank give you beer as crisp as a frosty morning! As practice makes the master, master barman Lukáš Svoboda will put you behind the bar and teach you how to tap the various typical types of beer: Hladinka (Smooth, half brew and half foam in the glass), Šnyt (Shnit, two fingers of beer, three fingers of foam, and one finger of empty glass), Mlíko (Milk, a beer almost entirely of foam), Na dvakrát (Crisp, the standard pour, full glass of beer with suds whispering at the top of the glass), řezané (Cut Beer, a blend of light and dark beer)... You will be educated in beer history and learn everything about beer's intricate journey to the pint. To keep hunger off, we will prepare the right kind of snacks. At the end of the class, you will receive a certificate and a present. Classes are for groups of 4–8 and take place from 1pm to 5pm at Lokál U Bílé kuželky. When fine food meets beer, they make a great couple. Enjoy 5 Czech dishes picked for you by the chef at Lokál U Bílé kuželky, accompanied by 5 world-famous or domestic beers. If you have anything specific in mind, we are happy to accommodate your taste buds. In charge of the two-hour long tasting is our master barman Lukáš Svoboda. Minimum 8 and maximum 14 diners. To Na Hrad or U Tygra? 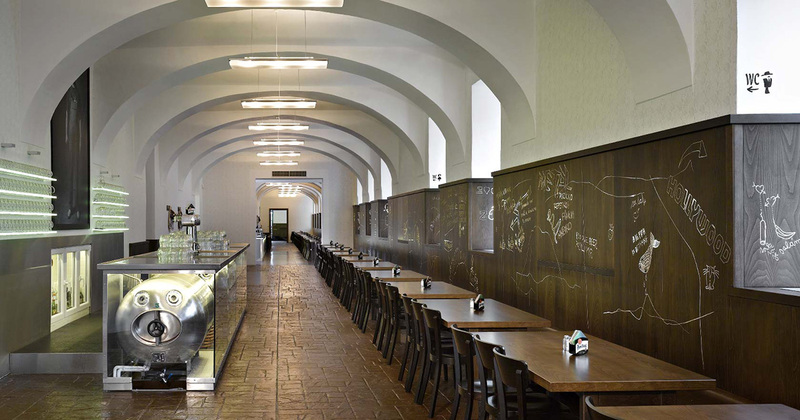 A new beer tour, a serious schooling in draught beer from Lukáš Svoboda is connected with a tour of Prague monuments with great beer, food and entertainment. We invite you to a five-hour tour of Prague, led by professionals from the field of gastronomy. They take you through the different parts of the Prague 'beer zoo“ – look forward to a themed walk, on which you can eat and drink to your heart’s content. We will show you Prague Castle, you will walk to the Lesser Town, Charles Bridge and even the New Town, finishing with you trying to tap the beer yourself. The walk is about three kilometres and the whole way you only walk downhill. The tour begins at 12:30 in front of the pub U Černého vola. For a group of 4 - 8 people the price is reduced to 2 900 CZK per person. A big day requires a big celebration! For the person having their birthday, we have a 90-minute lesson in beer tapping with our master barman, a tour through the beer backstage of our restaurant and a training behind the bar. Whilst in the role of the apprentice, you have the chance to serve your friends, as 20 large Hladinka-type beers are included in the lesson fee. Team up and learn how to tap beer. This off-beat teambuilding offers a master barman as your teacher. In an hour and a half, he will teach you the right way to tap beer, adding an engaging lecture and announcing a competition at the end. Those who don't wish to participate can just sip from their glasses. Minimum 8 and maximum 20 diners.